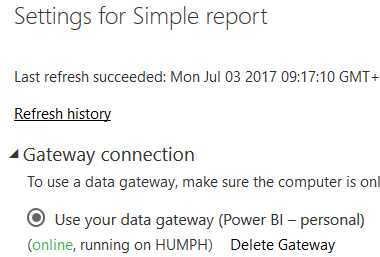 Let's assume that you've set up a gateway (if you need one) to refresh data. How do you control when and how refresh happens? 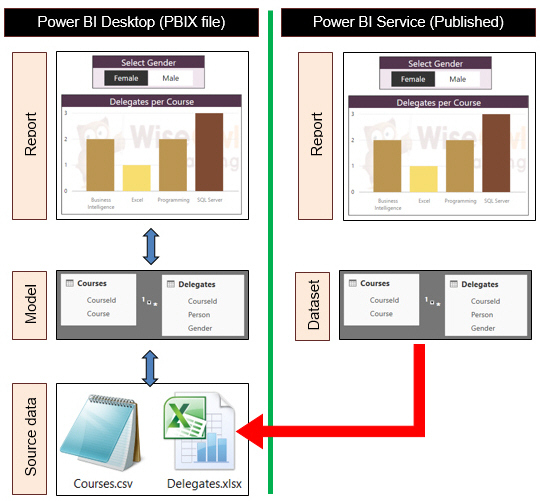 This page also considers the differences between Power BI and Power BI Pro as they pertain to refreshing data (basically, you can only refresh data once a day with the former, but once an hour with the latter). When you refresh a report, you upload ALL of the data for ALL of the data sources contained in the report's dataset. 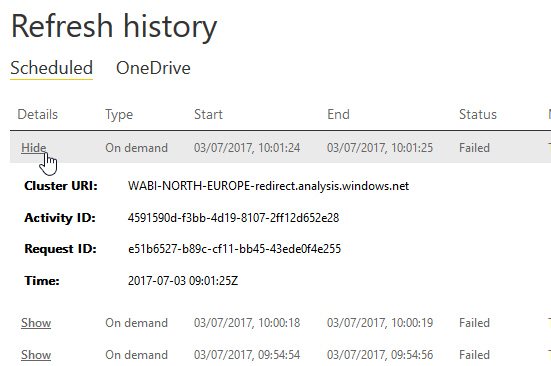 Automatic Data is refreshed automatically about once a day, or about once an hour if held in OneDrive. Manual You can click on Refresh Now to refresh data, or set up a refresh schedule. The rules for when and how data refreshes are insanely complicated, depending as they do on exactly which method you're using to get your data - see this Microsoft webpage for a full explanation. 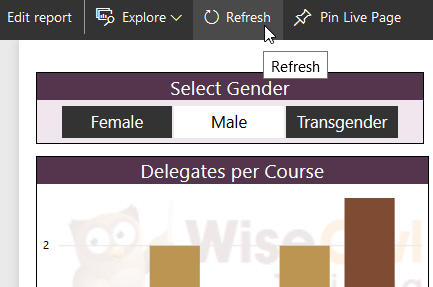 Click on REFRESH NOW to refresh the dataset. 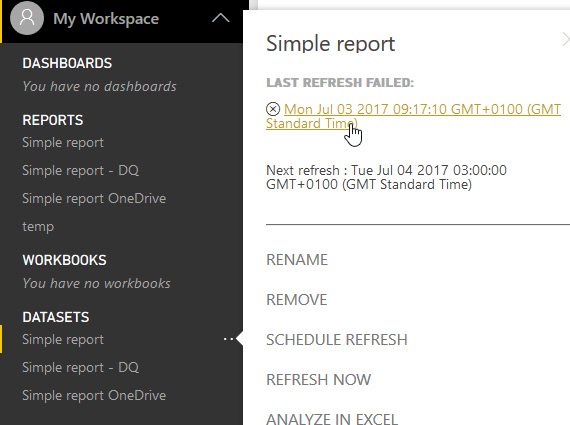 Click on the button shown to refresh your report's data. 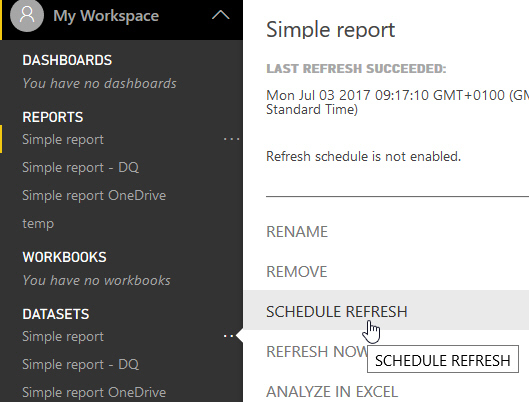 Reports and dashboards that you've created will not automatically update when the underlying data has changed - it's up to you to manually refresh them. Click on the dataset, and choose to schedule a refresh for it. Power BI Service selects the dataset you originally clicked on, but you can change this here. Choose the gateway that you want to use for this refresh. Choose to enable scheduled refresh, and choose a time of day and a frequency (daily or weekly). A refresh schedule with all of the time slots occupied. You can see the results of when you last tried to refresh the data for a dataset, and click on this link to see its refresh history. One of the most useful things in the above diagram is to see when the next refresh is scheduled. You can see that my last 3 refreshes all failed. 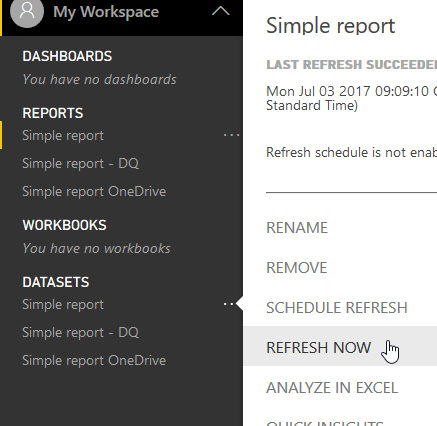 There used to be a difference to do with how often you could refresh data between Power BI and Power BI Pro (that is, between the free and paid versions of Power BI), but as of May 2017 both versions refresh at the same rate.